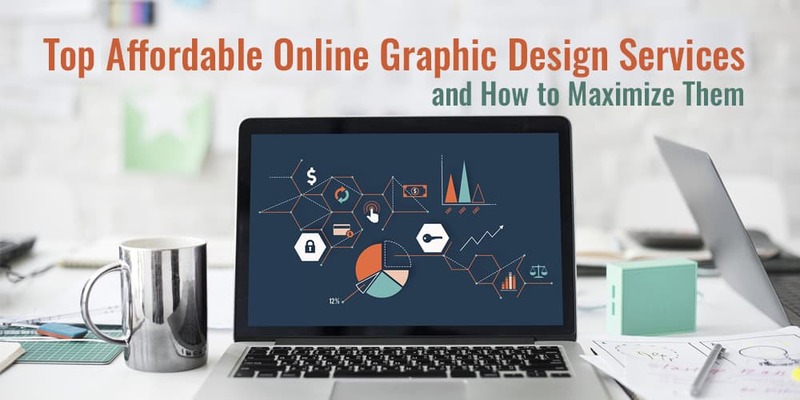 In today’s world of digital marketing, an infographic can be defined as a graphic visual that translates complex information quickly, clearly and in an engaging way. Stats like these are part of the reason that infographics gained popularity among marketers. However, many of these statistics date back to 2014 and before. With so many infographics flooding the scene, businesses may be wondering whether infographics are still effective or not. Yes, infographics are still effective! 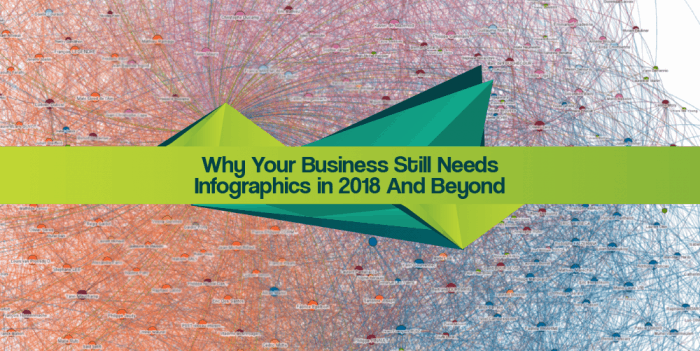 Here are just some of the reasons your business needs infographics as part of a marketing plan in 2018 and beyond. Marketers have talked about how traditional whitepapers are a relic of the past. 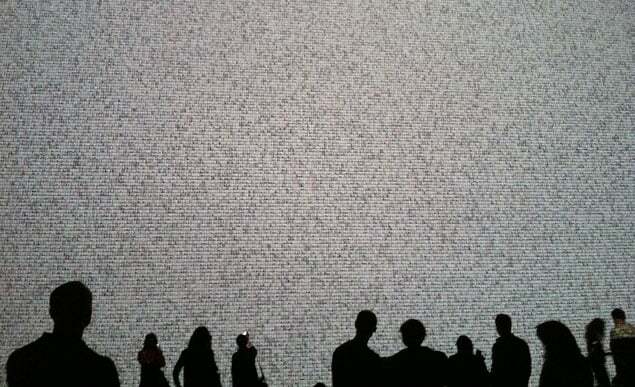 While we still need whitepapers, no one is interested in reading multiple pages on complex data. Customers and clients want information quickly and in a straightforward way. Infographic whitepapers are a solution to the dead whitepaper. 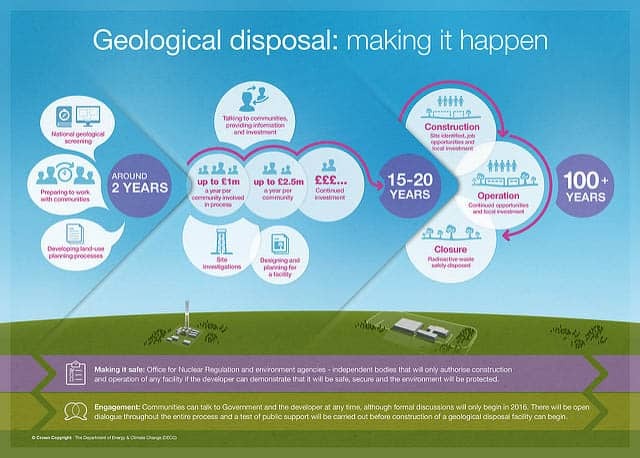 The infographic shown above was used in a white paper released by the UK government. Visualizations like these help strike the right balance between entertaining and informing, plus building brand collateral in the process. One of the reasons that infographics became so popular with marketers is because they are great for organic link building. All you need to do is include an embed code with your infographic. When other websites use your infographic on their sites, you get a natural link to your desired page. Infographics can also indirectly improve SEO because they do so well on social media. While social media isn’t a direct ranking factor, social matters for SEO: The top-ranked pages in Google have vastly more social signals than other pages. We live in a society where fake news is shouted from the rooftops. It might seem like statistics don’t matter in this world where people make decisions based on emotions and gut feelings. However, as The Guardian points out, this has actually created an opportunity for data. Individuals trying to “work out what is really going on” are hungry for data so they can make informed decisions. Infographics are a great way to provide this data to your audience. Note: It’s important that your infographic data actually be correct to get this benefit! Make sure that you do your research, aren’t cherry-picking data, and cite sources. Otherwise you’ll end up like these misleading infographics. If you need a reason why to use infographics for your small business, it is this. You can visit websites like Daily Infographic or Visual.ly, search for infographics in your industry, and then share them in blog posts or on social media. It doesn’t matter that your brand didn’t create the infographic. By sharing an infographic which is useful to your audience, you position yourself as an expert and gain the trust of customers. Of course, it is still best to create your own infographic with a unique story and branding. However, if your business budget can’t afford a design team, you can still share worthy infographics from the web. For B2B brands, the “About Page” is one of the most important pages on the website. Including infographics is a great way to get the message across while showcasing the personality of your business. This has been done excellently by brands like Moz, AirBnB, The Vehicle Group, and Visionaire. A lot of About Us pages also contain employee profiles. These profiles are great at increasing your conversions because potential customers find it easier to connect with real human beings. Take a cue from the new trend of infographic resumes and put employee profiles in infographic form instead of the standard, formal (read: boring) template. This helps the humanity behind your business shine through in a trendy, engaging manner. As Lucid Press points out, consumers aren’t just exposed to loads of content, they are exposed to competing brand messages all at once. If your brand isn’t able to keep consumers focused on your message, you risk losing them. Visuals are the first impression customers get of your brand. Visual content keeps customers engaged by compelling them to continue experiencing the content. Customers associate superior image quality with brand quality. Visual content is more memorable and keeps your business top of mind. So take a look through your website and other marketing platforms. How visually stimulating are they? 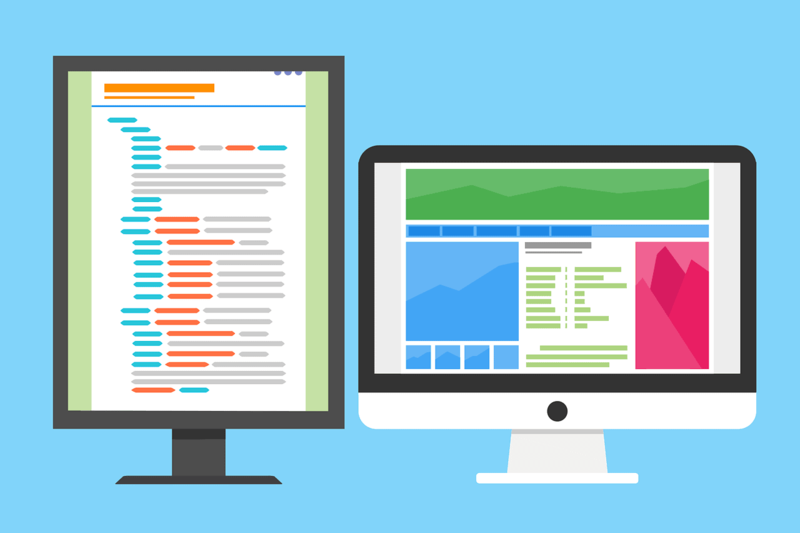 If your website fails to deliver on the eye-candy, then your business needs infographics. In April of 2017, Pinterest had 175 million active users. By September, that number had grown to 200 million (Source). There’s no denying the importance of Pinterest as part of a comprehensive marketing strategy. 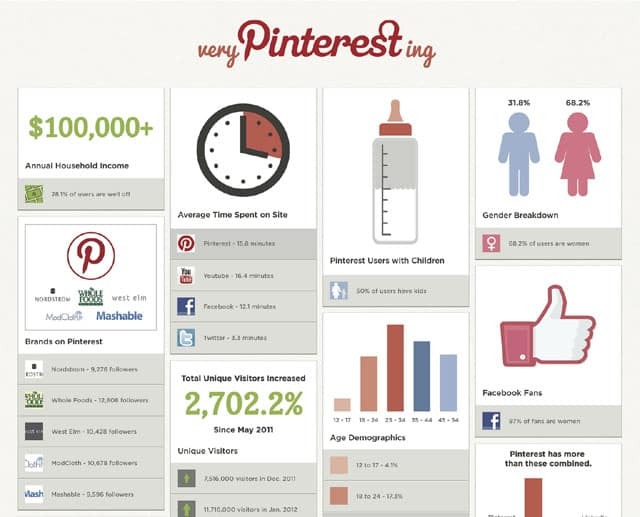 Your business needs infographics as part of its Pinterest strategy as a way to stand out. And, with the vertical image layout, scannability, and optimal pin size (which is approximately 735 x 1102px), Pinterest feed is set up for infographic success. Tip: Make sure the font on your infographic is legible on the Pinterest home feed, including when viewed on mobile. In today’s digital world, you’ve only got 7 seconds to grab consumers’ attention. How are you supposed to do this when you have complex information to convey? Practices like including headings and bullet points to make it more scannable are important for text content. In fact readers tend to stick around longer to read text that accompanies infographic. However, nothing beats infographics for making complex info digestible. You can still keep your long-form content (and should!) but supplementing it with an infographic is a great way to ensure all users – including those crunched for time – are satisfied. Let’s face it. If your content plan consists only of blog posts (or reports, videos, product images, etc. ), your users are going to get bored. To keep users engaged and coming back for more content, you need to offer them variety. 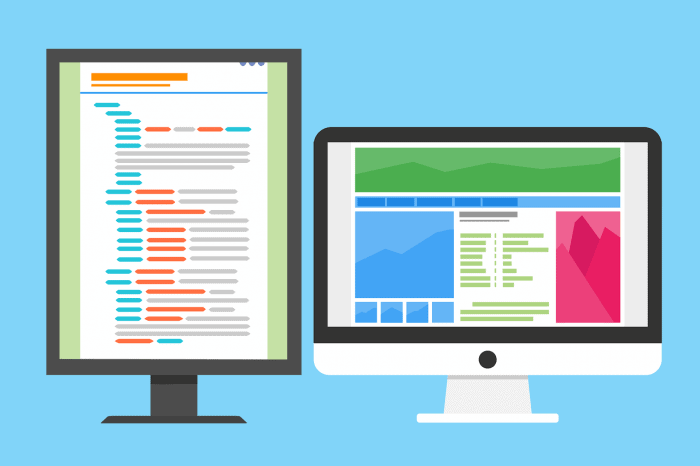 Infographics shouldn’t be the only type of content on your website and marketing channels, but they should definitely be a part of the overall plan! 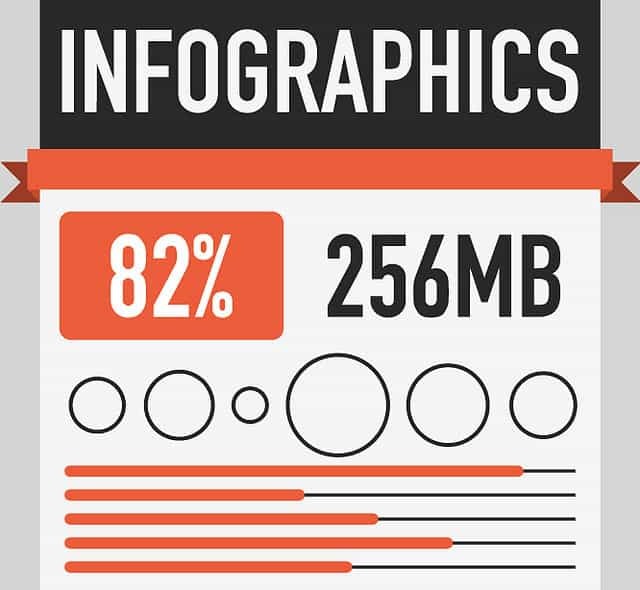 How do you use infographics in your business? Building a website is already challenging enough without having to worry about all the security features you’ll need. Research security firm Panda Security published a study revealing that 230,000 new malware samples are being launched daily. By 2021, the cost of cybercrime damage will hit the $6 trillion mark. Big businesses aren’t the only ones susceptible to cyber-crime. In fact, small businesses prove to be perfect targets for hackers, simply because they tend to be lackluster with security and therefore easier to penetrate. 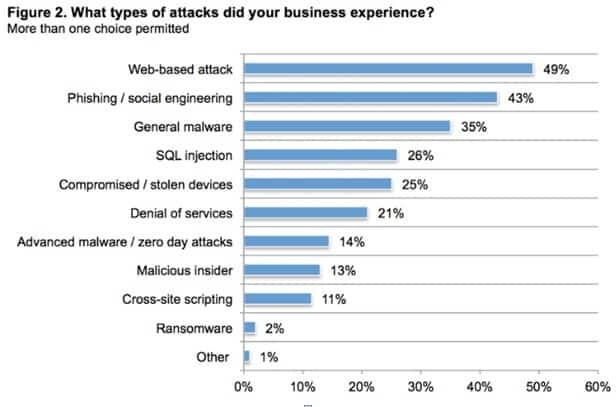 One study found that 60% of small businesses experience some type of hacking issue annually. If you want your lead generating landing pages just be just as secure as they are well-designed, there are certain precautions you can take. Here are a few landing page security tips to help your business. Content delivery networks (CDNs) make it easy for users around the world to access your site. Once a webmaster signs up for a CDN, they’ll have access to servers all across the globe. This means a person visiting your website on another continent does not have to wait long for information to be relayed from your origin server to their own local server. However, a CDN does much more than just increase relay speed; it also helps improve your website security. A CDN network comes equipped with dozens of edge servers, which can absorb a potential DoS attack from getting through. Therefore, the ability for a DoS attempt to reach a single point of failure is greatly diminished. This is important, since 57 percent of DDoS attacks were from multiple types. Some hosting companies are able to reel customers in with false promises and absurdly low prices. The fact is, hosting itself is already a pretty manageable expense. Choosing to shave a few dollars off a monthly fee can mean the difference between a safe site and an unsecure one. Consider some of the worst hosting horror stories: Crazy Domains, a website hosting company, tanked hundreds of business after it lost thousands of website data and offered only a $100 credit for the mistake. 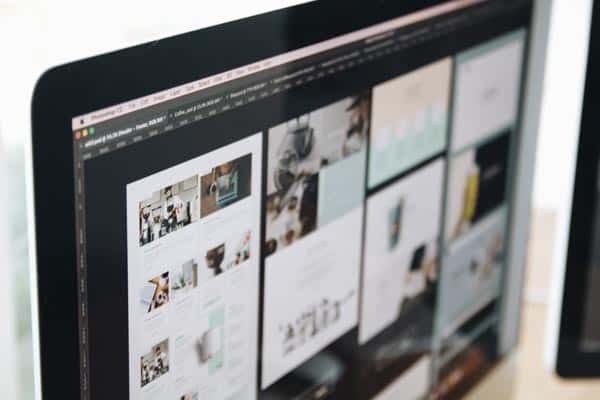 Claire Broadley, a website designer with over 20 years experience creating websites, detailed her many website hosting issues in this blog post. In it, she described how after one day of being with her first host, her site went down after a blizzard hit the hosts’ data centers. A great hosting company is protected across the board, regardless of any weather emergencies that might occur. Poor hosting companies don’t have the level of protection that your business needs. Always do your due diligence when choosing a host; read reviews, discuss your concerns with customer service, and pay close attention the way support teams handle your hesitation. 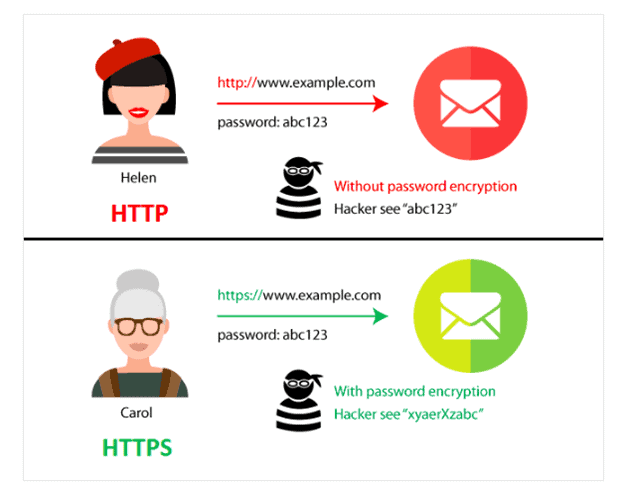 The difference between HTTP vs. HTTPS is important . . .
With that extra layer of security, data that’s transferred from the server to the website can be easily intercepted and stolen. With an SSL certificate, all in-transit data is properly encrypted to prevent this from happening. 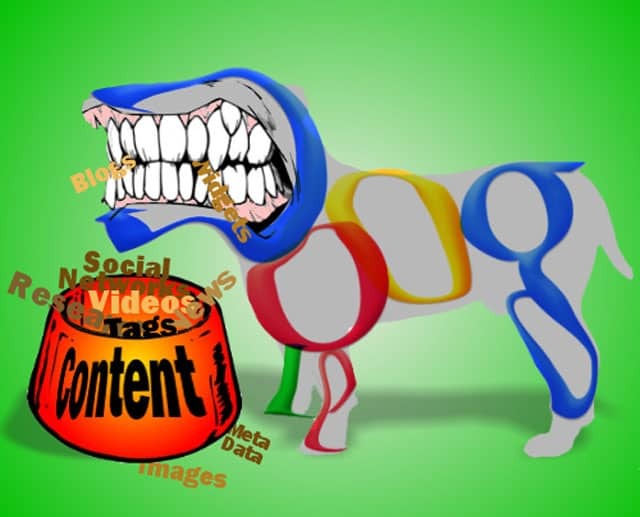 Furthermore, Google announced earlier this year that they would begin warning search users which websites weren’t properly secured, which could dramatically impact website traffic and SEO. If you’re using a platform like WordPress, you’re in luck. WordPress has a variety of security plugins that extend the security functionality provided by your host and other forms of security. Here are some of the best WordPress security plugins. WordFence is one of the more popular WordPress plugins. It continuously checks your website for any malware infections by scanning every single file on your site, on the back and front ends, including plugins, your theme, and the WordPress core. It also allows you to add two-factor authentication via SMS. There are several security features offered with Sucuri Security. Features include security activity auditing, malware scanning, blacklist auditing, and an advanced website firewall. Overall, it protects your site from brute force attacks, DoS attacks, and Zero Day Disclosure patches. According to iThemes, there are over 30 ways the plugin can protect your website. To start, it will scan your entire sure to be certain there are currently no vulnerabilities that would expose it to an attack. This preventative approach can help you out in the long-run. Like some of the other available plugins, it forces users to create ultra-strong passwords and has 24/7 security monitoring. It is important to note that the type of plugins you download and use on WordPress is important. In fact, many WP attacks happen through plugins. Making landing page security part of your business process is critical. The increased number of hacks and cyber attacks happening year-over-year is staggering, and protecting your business, whether enterprise or small business needs to be a must. There are a number of ways to make this a priority! Is site security on your mind? 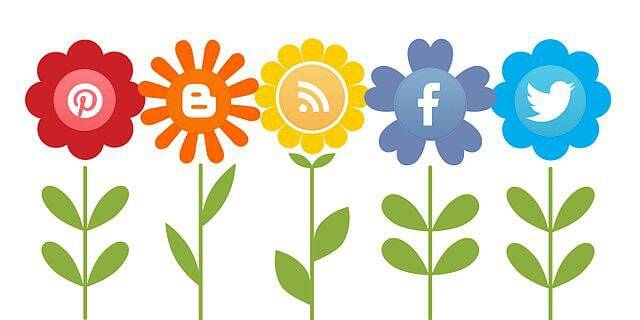 The world of digital marketing is rapidly changing. If you’re a performance marketer, you may sometimes feel as if you’re drowning in an alphabet soup of buzzwords, marketing speak, and confusing acronyms. If you’ve ever tripped your tongue on the differences between content marketing and native advertising, well, you’re not the only one. 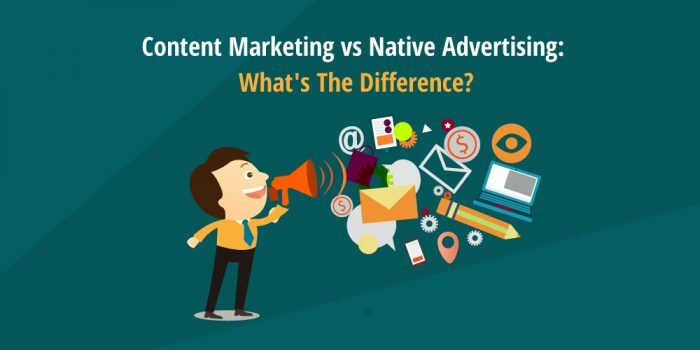 Content marketing and native advertising have certain characteristics in common – but they are not the same. As digital marketing becomes more advanced, and new tools and platforms unfold, it’s important to stay on top of your game. To do that, let’s take a separate look at content marketing and native advertising, and see exactly how – and why – they’re different. If content marketing seems to be a modern, internet-based phenomenon, think again. 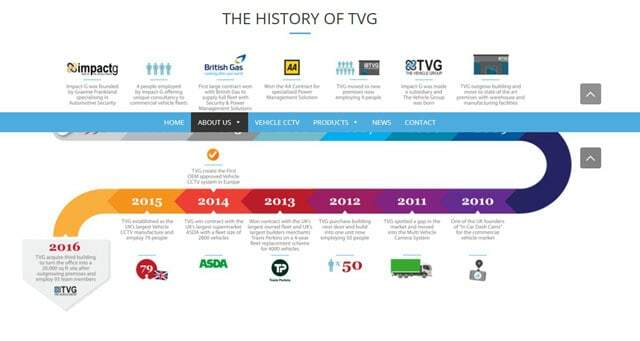 Content marketing has a long and impressive history. The earliest content marketing had the same goal as it does today – to drive brand awareness and customer engagement by promoting informative or entertaining content that gives value to existing and potential customers. You’ve probably heard of John Deere, the farming equipment company, but you may not know that John Deere is actually regarded by many as the grandfather of content marketing. This is because, in the late 1800s, the company began producing a magazine called The Furrow. The magazine provided farmers with information and advice from the world of agriculture. It was also a great way to get the John Deere brand out there to customers, not via advertising, but by marketing through relevant, valuable content. Over a century later, the magazine is still in circulation – in 14 languages! Much later, in the internet age, content marketing entered a whole new world of possibility. The ability to produce and publish content digitally and cost effectively, in a wide range of forms, has massively expanded the content marketing industry. So has the proliferation of computers, and especially mobile devices, which means that customers can access online content anywhere, anytime. Blogs, ebooks, videos, infographics, and interactive content, such as quizzes, surveys and more, are leveraged by brands to strengthen their image and message. 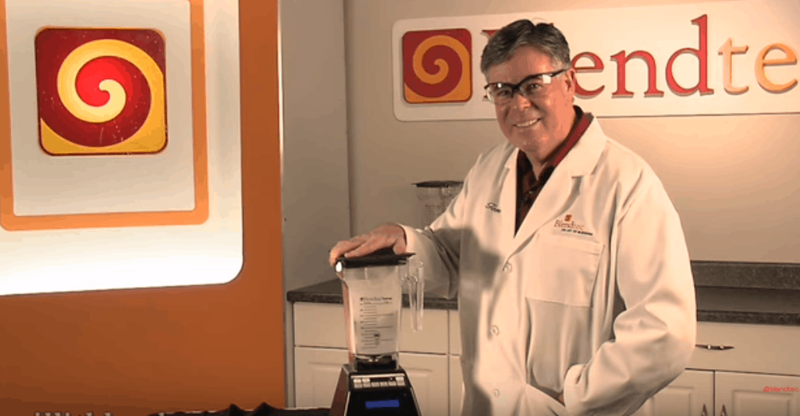 A classic example is the famous “Will It Blend?” YouTube video series by Blendtec, which has been ongoing since 2006. With over 200,000,000 views to date, the Blendtec video series is an ingenious piece of content marketing. The company founder stars in quirky short videos in which he attempts to blend objects in the Blendtec blender, demonstrating the product’s incredible power. Items such as iPads, marbles, diamonds and magnets have all been thrown in the Blendtec blender to answer the question, “will it blend?” The fascinating video series incorporates some of the most important aspects of content marketing, such as customer engagement. Many of the ideas about which objects to test in the blender come from popular requests sent in by the audience. Check out this infographic that gives a visual summary of the story of content marketing, from John Deere, to “Will It Blend?”, to today. To sum up, content marketing is the entire strategy of content-based promotional activities via the creation and publication of educational or entertaining content to drive customer engagement. It’s not one item in the performance marketer’s repertoire; it’s the whole kit and caboodle – and the kitchen sink! Native ads are paid advertisements that blend in with the format and feel of the channel or publication in which they appear. The beauty and power of native ads are that they are nonintrusive; they don’t engage in hard selling, such as a TV commercial or magazine ad might. Rather, native ads intend to inform, educate or entertain the reader, providing them with a value-added experience that creates a positive and memorable association with the brand. Here’s an early example of a native ad, for Quaker puffed wheat. Answer this question: does it look like a comic strip, or an ad? It definitely looks and feel like a comic strip, and that’s what makes it a native ad, rather than just a regular advertisement. Native ads are usually marked as such, so readers are aware they are viewing an ad, not an editorial piece. Notice how the word “Advertisement” appears at the top of the Quaker native ad. Another type of native advertising is the advertorial, which first appeared in the early 20th century. Advertorials are paid ads designed to look like an article, rather than an ad, based on editorial-style content that informs or entertains the audience. Here’s an oft-cited example of one of the best advertorials ever published. 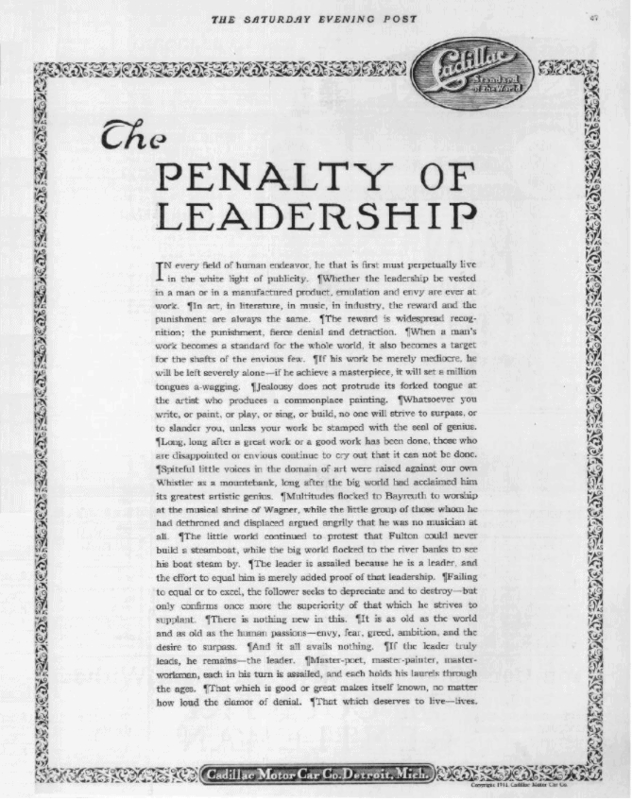 In 1915, the Cadillac car company, which was facing tough times, published an advertorial about “The Penalty of Leadership”. The native ad, which was only published once, is widely credited for turning around the company’s fortunes, as it so successfully associated the notions of prestige and quality with the Cadillac brand. Today, native ads are published in a few different ways – on social media platforms, in search results of search engines such as Google or Bing, and on content recommendation platforms. In the pre-computer age, native ads were just ads. They stood on their own feet. 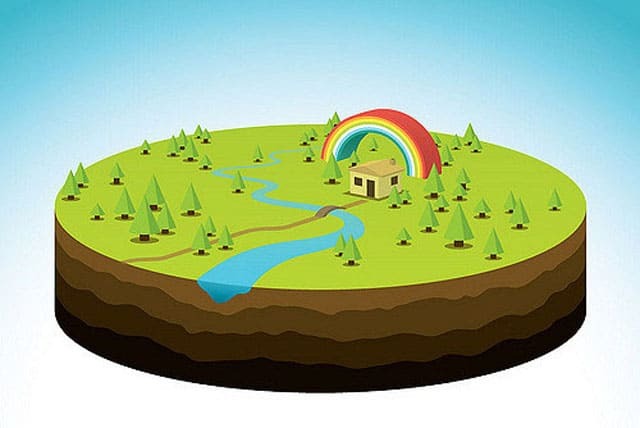 In today’s internet-based world, native ads are in fact, a means to an end – to get the reader to complete an online action (download an ebook, request a demo, watch a video, etc) that will take them down the sales and marketing funnel, with the intention of getting them to convert to a customer further down the road. Native ads are not just a form of advertising. They are a vital link in the chain of content marketing – but they are not content marketing itself. Think of it this way: native advertising is a few slices of the larger content marketing pie. In fact, it may surprise you to know that native advertising already accounts for over half of online advertising. In 2017, native ads overtook display ads in terms of dollar spend. And, some 43% of content marketers are using native advertising as part of their marketing strategy. Here’s an infographic to give you a visual overview of how native advertising has evolved over time. If you cut back on all the performance marketing noise, you’ll notice a key differentiator between content marketing and native advertising – and it comes down to cost. The content marketing examples cited above revolve around ‘owned media’ – that is, content created and distributed by the brand itself, on its own media channels and platforms, such as the company website and social media pages. The “Will It Blend?” videos are produced by Blendtec and promoted on their own YouTube channel. 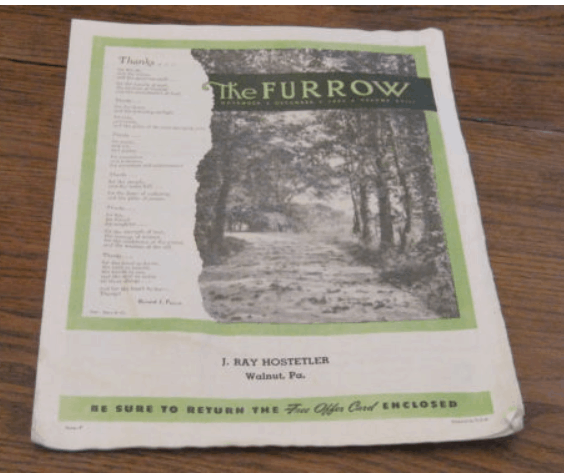 The Furrow magazine is produced, published and distributed by the John Deere company. Content marketing generally doesn’t include paid media, although a well-rounded content marketing strategy may also include paid advertising (such as PPC ads). Native advertising, on the other hand, is always paid for. The advertiser (or brand) pays a third-party publisher to feature its native ads on the publisher’s site or channel. 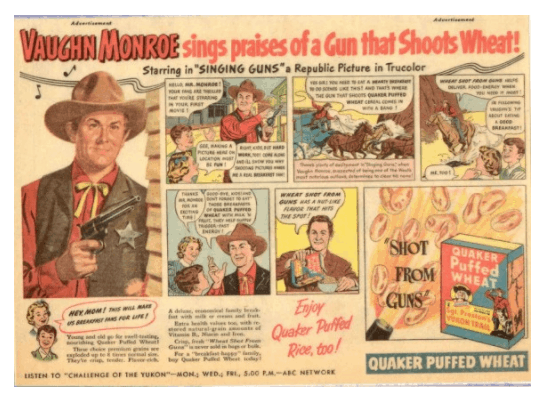 Quaker paid the newspaper to publish its native cartoon ad. And Cadillac bought the advertising space in the Saturday Evening Post for its native advertorial. In the online space, advertisers typically pay the host website for every click-through of their native ad. That’s right – native advertising is one method that you can implement into your whole content marketing strategy. But it’s also much more than just a method. Native advertising is perhaps an entire world of content marketing all its own because it works to drive customer engagement along the entire sales funnel. But remember, if you’re a performance marketer, native advertising – no matter how effective – can never be content marketing. So get back to the kitchen and start cooking your full course content marketing strategy! Consider the fact that, according to a study conducted by We Are Social, there were about 2.8 billion social media users around the world in 2017 – equivalent to a roughly 37% penetration rate. What are the odds that they’re all using the same social networks? That they’re all looking for the same things for the same reason? That the same piece of content will strike a chord with all 2.8 billion of them in the exact same way? The answer to all of those questions is clear: slim to none. Because when someone logs into Twitter to check their feed, they’re doing so for a different reason than when they log into Facebook or Instagram or Snapchat. They’re probably doing so from a different environment and they have a different end goal in mind. Therefore, it becomes of paramount importance that you understand what these goals are so that you can make sure you have the right type of visual content for the right moment on the right channel moving forward. We’ve talked at great length in the past about what goes into creating a high quality, compelling piece of visual content – so we’re not going to retread all that here. For the sake of discussion, let’s assume that you’re sitting in front of a terrific piece of collateral that you can’t wait to get out to the widest possible audience. So where, exactly, should you post it? Facebook users tend to spend more time on page than a lot of other sites, so the visual content that tends to work best here includes as much video as you can post. Along the same lines, Facebook is also a perfect outlet for curated content – so if you see a particularly helpful article in your travels around the web, don’t be afraid to share it. Instagram is a visual-based social network, so it stands to reason that content that is heavily visual works best. High resolution images, quotes and other types of content that essentially stand on their own and require as little explanation as possible are really going to strike a chord. Twitter users are in it for the short bursts of critical information, so this would be a great outlet for your visual collateral based on news items or other highly relevant topics. GIFs also work great on Twitter. Since this is a professional network, it stands to reason that the content you create should be professional driven as well. This would be a great place to post all your visual content about your actual business and its employees, for example. Pinterest users tend to love content like infographics, step-by-step guides (complete with as many photos as possible) and much more. So when you sit down with a tool like Visme (which I founded to help people communicate visually) to work on that next big infographic, you’re probably going to want to start with Pinterest and Twitter when it comes to publishing because it’s right in the wheelhouse of what those users are already looking for. When you come to something that is a little more long form like a flyer, Facebook would probably be the way to go – because it’s users still love visuals but seem to be willing to take a little more time to really digest something should the need arise. Note that you can also use Visme to create terrific social media graphics, which is another opportunity to really help sell the visual aspect of your social media presence. You’ll still want to keep the specific audience on a network in mind before you pull the trigger, however. 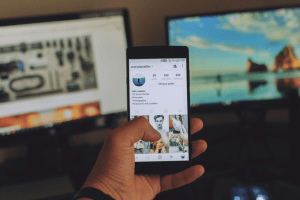 In essence, don’t create social media graphics for social networks in general – really break things down and take a different approach to creating something for Pinterest than you would for something like LinkedIn. The former lets you be a little more fun and exciting while the latter does not – you don’t want to put off a huge portion of your audience with the right type of graphics as that will only put you farther away from your goal, not closer to it. Likewise, let’s say for the sake of example that you really want to appeal to a younger audience so you want to start incorporating memes and similar types of fun materials into your messaging. Facebook would be a really great place to do something like that and memes in general even work wonders on Twitter… but keep it off of a site like LinkedIn. LinkedIn is decidedly more professional that Facebook or Twitter (probably combined) and you really want to put your best foot forward in that regard. Nobody is saying that your entire online presence has to be “all business, all the time” – but you have to know how and when to pick your spots, so to speak. Really, what you’re doing is pairing the content you’re creating, the audience you’ve created it for and the goals you hope to achieve with the right platform on which to excel in those areas. If you’re able to do that on a regular basis, you won’t have to worry about finding success – you’d better believe that success is going to find your. Along the same lines, you’ll also want to work hard to maintain the proper ratio of helpful, engaging and inspiring posts to direct sales posts regardless of which social networking site you choose. As a rule of thumb, try to stick to making roughly 80% of your posts inspiring, engaging, or thought provoking in some way. Then, you’re free to use the other 20% to focus more on selling your products and services. The key is that you want to be more helpful than salesy, because “sales driven” has a habit of turning into “pushy and overbearing” before you even realize that you have a problem. But again, all of this is staying within the lines of the social network-specific guidelines that we were discussing earlier. A lengthier, more thorough inspiring post should probably be targeted at Facebook and the same is true of a longer, more detailed sales post. Just like your Infographics – both those that aim to inform and those that are trying to sell – would probably be more at home on a site like Twitter. Turn it into a 500 or so blog post that winds up on your Facebook feed. Pull out all of the stats that highlight the impact you’re making and turn it into an Infographic for Twitter. 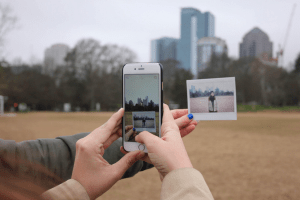 Take all of those photos that you took during a specific community outing and post them to your Instagram account. Highlight the community organizations that you’re working with and turn it into a blog post for LinkedIn and highlight why this all matters. Suddenly, you’re talking about four high quality pieces of content that all came from the same core idea. They all tell the same story, just in totally different ways depending on where they will eventually wind up. Any one of your customers could encounter only one of the four pieces and get a complete story, but by diving into all of them they have a much more complete picture from a variety of angles. 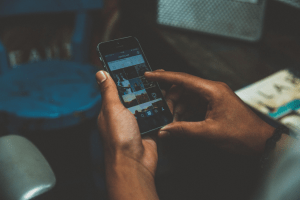 In the end, the most important thing to understand about social media marketing in the modern age is that engagement should always be your number one goal. Raising awareness is great and all those followers may or may not translate into a sale, but making your top priority anything less than engagement essentially means looking a digital gift horse square in the mouth. Every social networking site has its own unique strengths and weaknesses, which means that users are already engaging with those platforms in very different ways. 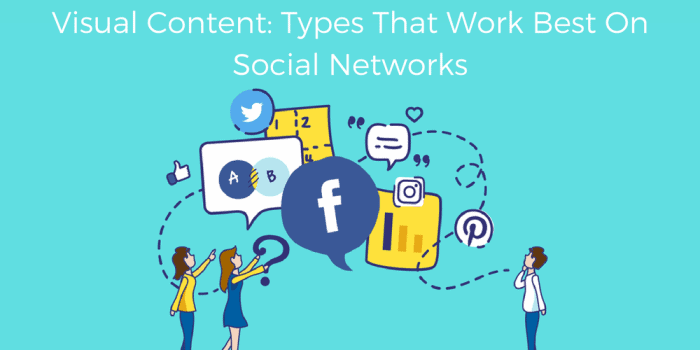 By understanding WHY people use Facebook over Twitter and HOW they engage with those platforms, the answer to WHAT type of content you should post becomes overwhelmingly clear. None of that is to say that the same piece of content won’t work equally well on two separate networks, but by creating content for a specific audience for a specific network you’re putting yourself and your campaigns in a much better position to succeed than they would be otherwise. Despite currently trading around $8,000 and steadily increasing in popularity, cryptocurrencies are often still marred by fear and negative media coverage. Bitcoin is transparent and digital, meaning when using it you don’t have to worry about counterfeit money. It’s the first successful use case of blockchain technology in digital payment. As Bitcoin’s introduction verges on its 10th year, it’s starting to gain further widespread adoption around the world. 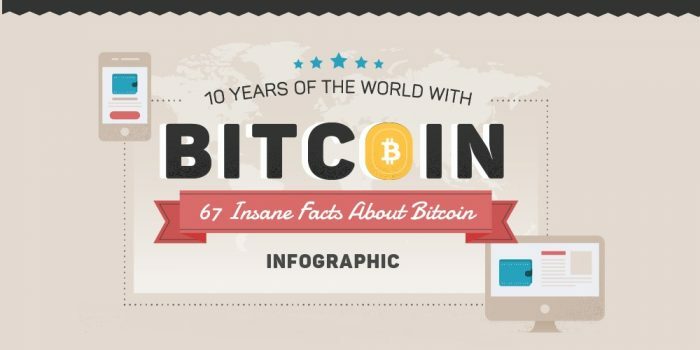 Here are 10 moments in its history that stand out as well as a bitcoin infographic with 67 insane facts. You might assume that somebody who creates a new currency is probably in it for the money, and while Bitcoin’s mysterious founder Satoshi Nakamoto is estimated to own $4.7 billion worth of BTC, it’s the radical agenda behind the technology that has inspired many people to show their support. “The Times 3 January 2009 Chancellor on brink of the second bailout for banks,” was the message Nakamoto left in the very first block that was mined that month – referencing an article about the financial crisis and the UK’s taxpayer-funded bank bailout. Bitcoin is not controlled by any central government or authority, transactions are pseudonymous, and there are no inherent restrictions preventing any individual from using it as long as they are able to connect to the internet and use the web. Even in countries where BTC is outlawed, there isn’t always a realistic way to enforce the ban. Without these radical elements, it could be argued that Bitcoin would not be as successful, as there wouldn’t be anything particularly unique about it. An example of BTC’s rise in value is “bitcoin pizza day,” the day which commemorates the very first consumer purchase using the currency. 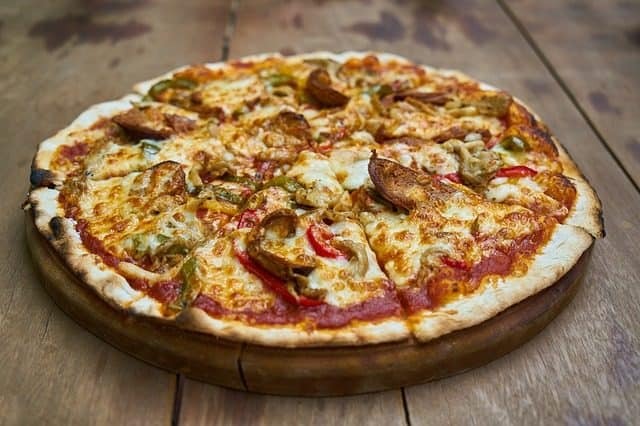 On May 22, 2010, Laszlo Hanyecz bought pizza from 18-year old Jeremy Sturdivant, for 10,000 BTC, totaling approximately $25 at the time. Today this is worth over $50 million! It wasn’t a direct transaction with the pizza place; rather Hanyecz sent the money to Sturdivant who agreed to place the orders. Unfortunately, it is not known what Sturdivant did with his coins and if he’s now living the high life or kicking himself for spending them up before the boom in value. However, one person we do know who is kicking themselves is Hanyecz, who probably should have just made a sandwich and held on to his fortune. Numerous independent and larger pizza chains now accept payment in BTC. Also, there are several online services that allow customers to pay a middleman in BTC, who will then order a desired service on your behalf in regular currency. Although the US was its birthplace, Europe was quick to embrace Bitcoin. In 2011 French based exchange Bitcoin Central was the first exchange to be licensed under European regulation. It subsequently assured customers’ balances up to 100,000 EUR and offered debit cards with access to BTC balances. In practice, this meant that Bitcoin (BTC) could be immediately exchanged into Euros at the point of sale or ATM. In 2014, Belgium and Finland decided the cryptocurrency was exempt from VAT, meaning trades could be legally made without buyers being subject to tax. In 2017, Swiss private bank Falcon became the first bank to sell bitcoin directly to its customers. The tradeoff is that anonymity is lost as transactions made by an account holder can be linked. It might not quite have the clout it used to, but Time Magazine featured Bitcoin in, giving it a rubber stamp of relevance among mainstream media. The article looked at the potential risks to users and barriers from governments, its use in the illegal dark web marketplaces, and its steep learning curve. Simultaneously it explored the benefits and then revolutionary concept behind the blockchain technology. Since then, the magazine has done many more pieces (both positive and negative) on Bitcoin. Are bitcoins accessible to the average person? Do they work as a day-to-day means of exchange, or are they just for geeks, ideologues and investors? Austin Craig and Beccy Bingham proved in the summer of 2013 that, yes, you can get by using only BTC. However, their 90 day experiment wasn’t easy – they could only use Skype to make calls, and purchases were dependent on whether they could convince retailers and service providers to accept the currency or use the kindness of friends and strangers to act as middle-men. Of course, we’ve come a long way since then. Now even some gas stations are accepting BTC, and you can pay at many independent stores for groceries and other goods. In an effort to ease transmission difficulties for certain students, the University of Nicosia in Cyprus began accepting BTC for student tuition in November 2013. In addition to being a practical move, he stated that it was a way for the institution to learn more about the technology firsthand. A center of learning trying to learn something new? What a novel idea! 2013 was a big year for bitcoin as it saw its value skyrocket from $125 in the September to over $1,100 by the end of November. This was heavily tied to the market’s expansion into populous China and a perfect storm of new media coverage and bullish investing. Of course, rapid booms tend to preclude busts and the collapse of leading exchange Mt. Gox, a ban in China, numerous hackings, the closing of the illegal marketplace the Silk Road, and lots of negative coverage ensured this would be deep and painful (but not fatal). Bitcoin’s value plummeted to $400 in April 2014 and hit lows of about $200 in January 2015. Nonetheless, the community saw where Bitcoin could go and it would go higher still. 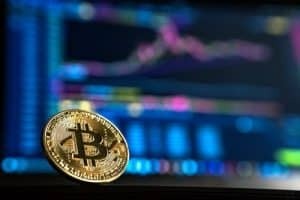 Their optimism was confirmed with aplomb when BTC rose to almost $20,000 in value at the end of 2017. It’s one thing when an independent hipster coffee shop or an online tech store offer bitcoin as a payment method, but when a mega corporation like Microsoft gets behind something you know it has legs. They began accepting BTC as a form of payment for digital items in December 2014, in partnership with BitPay – today’s leading Bitcoin payment service provider that launched in 2011 and was the first to offer a wallet on smartphones, making it much easier for the general public to get involved. Microsoft also allows you to add money to your account with BTC via the ‘Redeem bitcoin’ feature. If you can’t beat them join them; this seems to be the perspective of governments, banks and other institutions that are now researching and investing in blockchain p2p technology themselves – a clear example of Bitcoin’s success. In May 2015, NASDAQ adopted the blockchain to handle transactions. Then in September, Goldman Sachs, JPMorganChase, and Bank of America were among nine of the world’s biggest banks to join a pact to build the “fabric” of blockchain technology for the banking industry. In March 2016, broker ICAP was the first to distribute data on trades to customers using blockchain, and in the May Santander became the first British bank to start using the tech for recording international payments. In 2017, the US Government began investing in blockchain to protect healthcare companies from hackers, and by 2020 Dubai wants all government transactions to be blockchain-powered. Despite all these entities owing their innovation to the founder of Bitcoin, the digital currency’s advocates are keen to point out that the technology was supposed to bypass the old guard, not empower it. The Mt. Gox saga is commonly considered a black mark on Bitcoin history. After all, in early 2014 there was a major scandal that saw the disappearance of approximately 850,000 bitcoins the exchange was holding in wallets and trades. By May 2016, creditors of Mt. Gox had claimed they lost $2.4 trillion because of the bankruptcy. Yet, despite such a massive failure of the BTC market (at one time Mt. Gox was processing 80% of all currency trade related transactions), the cryptocurrency survived, rebounded and continues to thrive. It was a much needed wake-up call for the community. Despite inherent encryption, entrusting third parties without security protocols to get it right was naïve. Now everybody knows better and the market is stronger because of it. 2017 was the year of Bitcoin. The cryptocurrency began the year valued just over $1,000 and finished it at nearly $20,000. This massive increase in value saw it emerging from geeky-obscurity into the mainstream with force. News channels, newspapers, sites that had never covered the topic before, all began blabbering about the new phenomenon, spewing controversial information and unchecked facts. The surge of popularity led to many new investors joining, but also many got burned by the prodigal volatility of the cryptocurrency, which has more than halved in value since its zenith in late December 2017. *Post contains affiliate links, which if used may result in a trickle of commission(at no extra cost to you) to help support Daily Infographic. Thanks! Today’s marketing world is increasingly visual. No matter how great your product or content is, it won’t get noticed if it doesn’t have stunning visuals to accompany it. Luckily, there has been a surge in affordable graphic design services. Whether you need a logo, infographic, website layout, brochure, or something unique, these platforms are great places to go for graphic design services on a budget. 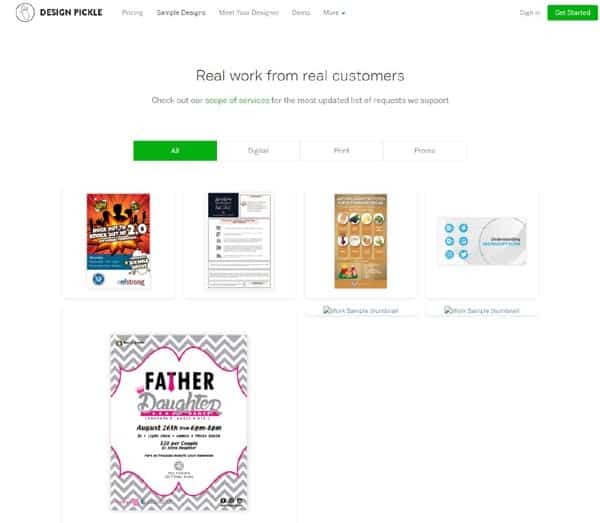 If you still haven’t heard of Fiverr, then you are missing out on a platform for finding dirt-cheap graphic design services. Yes, a lot of the services actually do cost just five dollars – especially jobs like logos, business cards, and simple banner ads. For anything more time-intensive or creatively demanding, you’ll need to pay more than five dollars. Most sellers offer a variety of options and add-ons (such as paying extra for more revisions or certain file formats). You save money by paying only for the design services you actually need. 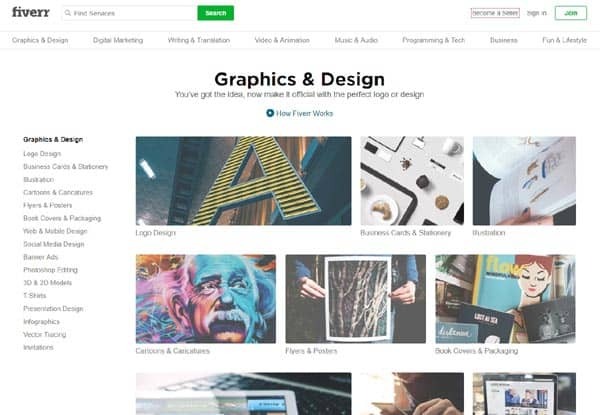 Even the “expensive” graphic designers on Fiverr can be relatively cheap, since the platform taps into global talent. You can typically find a professional quality logo, brochure, banner, book cover, or even custom illustration for under $50. 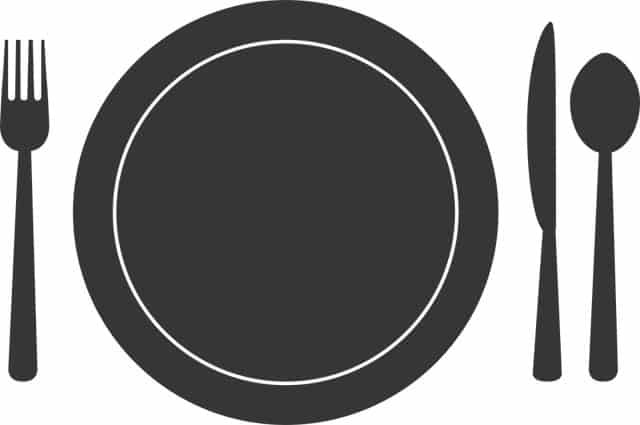 The platform has more of a product focus, where design services are offered with a focus on the product and the price, for example “$20 professional logo”. As a result many of the freelancers operate under screen names and you’re often not sure of the identity of the person hired. *Be wary of any graphic designer that seems too good to be true. It’s impossible to completely verify the freelancer’s portfolios showing examples of their work. Since gigs are cheap, it is also easy for service providers to build up fake positive reviews. Luckily, Fiverr has a dispute policy and money can sometimes be refunded when the work is not up to par. Formally known as Elance, Upwork is one of the largest platforms of freelancers marketing their services. As expected, there are plenty of affordable graphic design services to be found. Using Upwork is fairly simple. You create a public job, set the budget, and wait for freelancers to apply. Or, you can create a private job and invite only selected freelancers to apply. Either way, you’ll have a large pool of candidates. Upwork has a freelancer based focus, as opposed to a product based like Fiverr. Real names are used and Upwork may required identity document verification. Freelancers upload work to their portfolio and even have tests to prove skill knowledge. 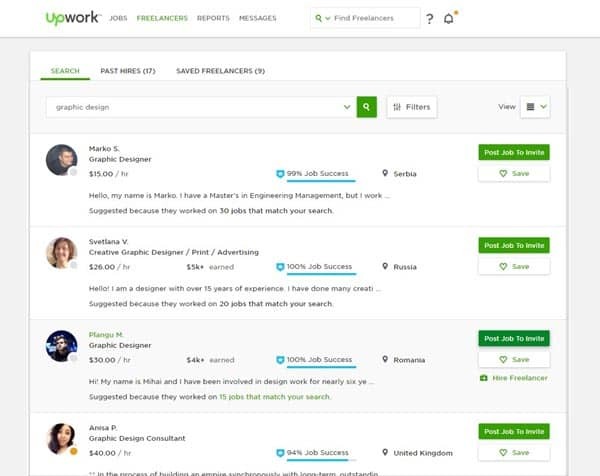 You may still have to weed through lower quality freelancers, but Upwork also has a “job success score” that helps to rate freelancers based on past work. The reviews on Upwork tend to be more reliable. Especially if project costs are higher, it would be costly for a freelancer to get friends to write fake reviews. You can also check the history of the reviewer, which means it is easier to spot fakes. Hiring a graphic designer online can take a long time. 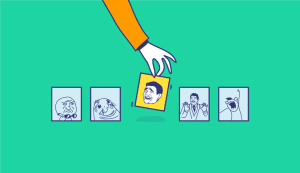 You first need to narrow down the candidates, and after hiring spend time communicating with the designer to make sure the parameters are understood. For simple jobs it might make sense to just do the work yourself. PicMonkey is a good solution for people who want to take a DIY approach to graphic design, but are intimidated by Photoshop. You won’t be able to create stunning logos or visuals from scratch with PicMonkey. However, the service does allow you to easily touch up existing photos, make collages, create album covers, and create social media ads using templates. The platform is heavily marketed towards small business websites and bloggers, particularly ones who want to expand their social media presence without having to add an additional member to their staff. 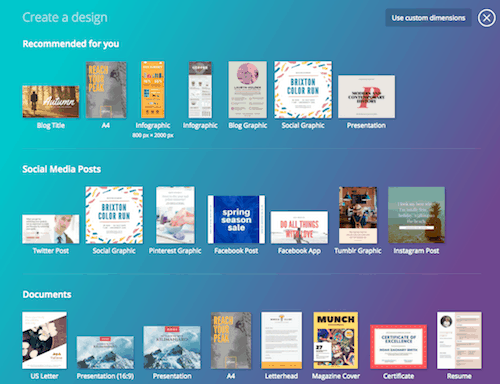 Canva is a popular design tool that’s free and easy to use without any design experience. The site offers templates and is popular among bloggers, content marketers, small business owners alike. Designed for work, school, and play, it even offers design tips for non-designers. The interface is intuitive and easy for anyone to use. Whether it’s creating presentations, magazine covers or simple marketing materials, you can create beautiful graphics with the provided layouts. Even for designing mockups this would be a great place to start. For more efficient teamwork, Canva offers a paid service called Canva At Work which allows integration with several team members. Design Pickle offers an innovative flat rate approach to affordable graphic design services. Instead of charging you on a per-project basis, they offer unlimited graphic design services for a flat monthly fee. They were created for the average non-creative small business. After signing up for the service, you are matched with a graphic designer who will be primarily responsible for your designs. They’ve pre selected a team of designers trained for high volume work. If that designer goes on leave, another one will fill in, ensuring on call design services. While you do get unlimited work each month for the fixed price, the jobs are queued up in your dashboard. You set which ones have priority and these are done first. Turnaround depends on the total request volume and complexity. 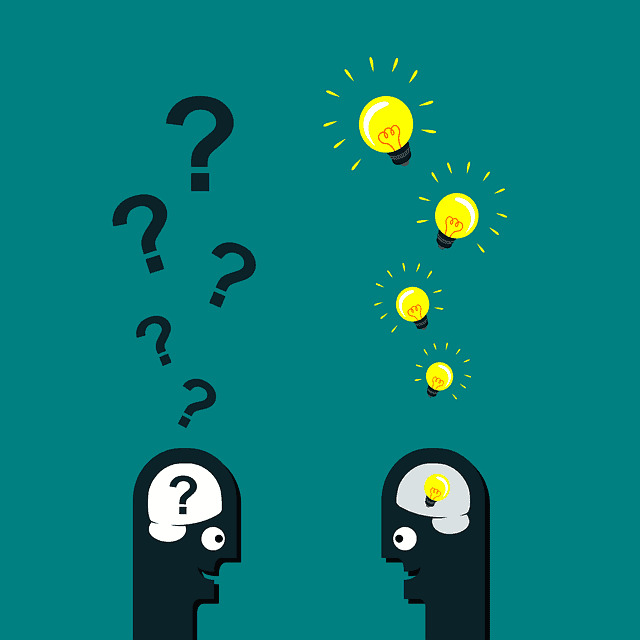 The service fits people who can answer yes to the following question: “Can I reasonably explain or show what I want in an email?” If you have an eye for design and know exactly what you want, or you only need simple tasks done regularly, you may find these services valuable. While some platforms are better for certain types of design work, it is ultimately about how you use the platform. Whether you want to use one of the affordable design services listed above or another, make sure you follow these tips. Don’t think you can ask for a “design for XYZ industry” and get great results. 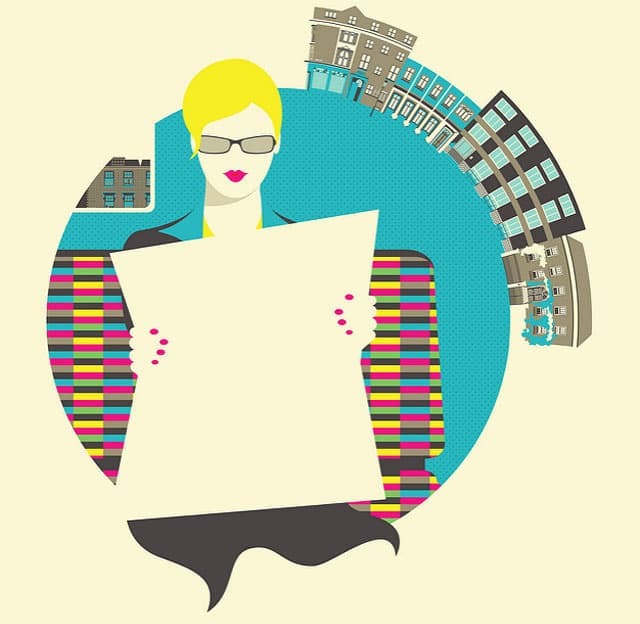 For graphic designers to succeed, they need details about what you want. Finding a good quality, affordable graphic designer can consume a lot of your time. So, when you do find one, you don’t want to let him or her go. That is why it is so crucial to look for long-term relationships. Established profiles: This shows that the designer is a professional. They also don’t want to waste time applying for jobs and will happily build long-term relationships with clients. A frequent rehire rate: Some sites will show you this; with others you have to look for multiple reviews from the same client. Full time freelancers or services: If the designer has another full time job, there may be other demands on his/her time. This is one of the challenges of working with freelancers in general though, you won’t always know if your preferred designers are available for quick turnarounds. Some of the productized services or agencies can help solve his problem. It might seem counterintuitive to pay more than necessary within a competitive market. 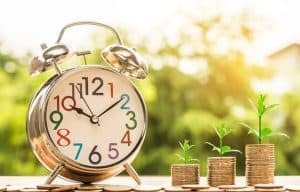 But once you’ve invested in a freelance hire, monetary incentives can often pave the way for a more productive relationship. As with most employees, designers enjoy being rewarded for consistent work that exceeds your expectations. What are your favorite sources for affordable design work?